Robert Charles Lamin was in the Absentee Voters List for Muston, 1918, as 204490 Gur. 29th Batt., R.F.A., his home at Goodson’s Farm, Muston. However, it may be that this should have indicated the 25th Battery rather than the 29th. Robert Lamin was born at Langar in the Vale of Belvoir, late in 1887. His parents were Henry Lamin, b.1846, and Ann Rebecca Lamin, b.1849. Henry Lamin was a farmer, born in Harby, Leicestershire, Ann came from Orston, Nottinghamshire. In 1892, the Lamins were at Village Street, Muston. Grandfather Henry Lamin, b.1812 at Harby, Leics, was a 79 years old widower. With him were his son Henry Lamin, 45, born 1846 at Harby, and his wife Ann R. Lamin, born 1848 at Orston, Notts. With them were six children: James W. (born about 1874), Alice B. (born about 1876), John H. (born about 1878), Tom Edward (born about 1885), Robert Charles (born in 1887) and Frank W. (born about 1890). In 1901 the family lived in a farm house on Grantham Road, Muston. Henry senior had died and John is no longer listed, but there were five children: James W., Alice B., Tom Edward, Robert Charles and Frank W. In the 1911 census they were still living in Muston, but Tom and Robert were the only children at the family home, both recorded as ‘farmer’s son, working on farm’. There were also three employees living with them and a visitor ‘of private means’ called Catherine Alexandra Topps. Surviving records tell us that Robert Charles Lamin served as a Gunner in the Royal Field Artillery, based at Woolwich. His enlistment details have not been located, but it is recorded that he moved to 6B Reserve Brigade, Edinburgh, on the 28th March 1919, and that he was awarded the British War and Victory medals in 1921, before being finally discharged from the army as late as 1924 presumably having remained after the war as a reservist. It is not certain which unit he served with in the RFA. The Absentee Voters List states the 29th Battery. But records for him are held by Forces War Records indicating the 25th Battery, 35th Brigade, adding that he was treated for ‘inflammation of connective tissue, leg’ in June 1918 while serving in Italy. The Long Long Trail confirms that the 25th Battery formed part of the 35th Brigade, RFA. 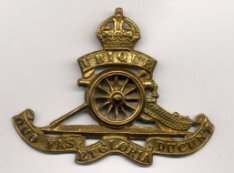 The 29th Battery was part of the 42nd Brigade, RFA. The 25th Battery served in Italy in 1918, whereas the 29th remained in France, so it is more likely that Lamin served in the 25th Battery, and that there is an error in the Absentee Voters list. Both RFA batteries saw long action throughout the war, fighting in major battles on the Western Front from 1914 to 1917, and in the case of the 29th carrying on through 1918 until the Armistice. Robert Lamin is recorded in the electoral registers from the postwar years. In spring 1922 he was at Goodson’s Farm, Muston, with his mother Ann Rebecca Lamin. At this time, his brother Tom Edward Lamin lived next door at Geeson’s Cottage with Ann Lamin, probably his wife. In 1925 Robert and Ann Rebecca were still at Goodson’s Farm, now joined by Agnes Margaret Lamin, probably Robert’s wife. Tom and Ann were still next door at Geeson’s Cottage. By 1931, Robert and Agnes had moved into Duke’s Cottage, while Tom and Agnes had moved into Goodson’s Farm. Robert Charles Lamin died at Leicester in 1980, aged 93. Thomas Edward Lamin (Tom) was Robert’s older brother, born in 1885, and may well have enlisted or been conscripted into the forces. Like Robert, he was born at Langar, and by 1911 was working on his father’s farm at Muston. Thomas Lamin married Ann Baker in 1909, Grantham district. His wife was not listed at the Lamin farm in the 1911 census, but she is present with Tom in the postwar electoral registers. However, we have not located any service records for him. There are records for a Tom Lamin, R/133 Able Seaman, RNVR, who was killed at sea in 1917 when 23 years old, but this is clearly not the Muston farmer’s son. There is also a record in the London Gazette Supplement of a Nottingham man, 241057 Pte H Lamin, Northumberland Fusiliers, but this also does not match Tom Lamin of Muston. Thomas E Lamin died in 1976 at Newcastle-upon-Tyne, aged 91. There is some question as to whether he served in the 25th Battery RFA or the 19th Battery RFA.